President Donald Trump announced that his meeting with North Korean leader Kim Jong Un will take place in Singapore on June 12. 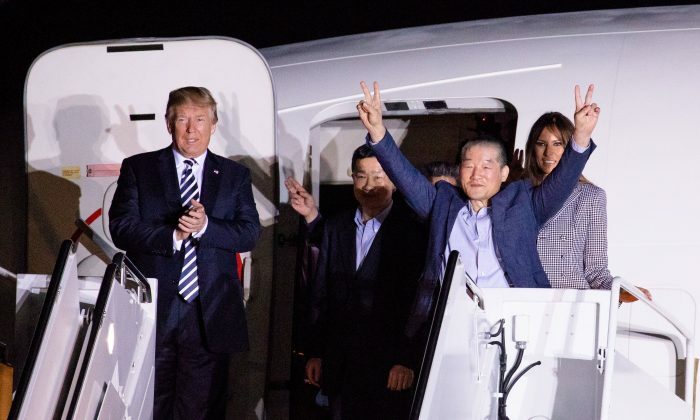 The president’s announcement came hours after three Americans who were imprisoned in North Korea returned to the United States accompanied by Secretary of State Mike Pompeo. Trump and First Lady Melania Trump met the freed detainees in person at Andrews Air Force Base in Maryland at 2 a.m. on Thursday. The release of the detainees was the latest in a series of major concessions by Kim Jong Un ahead of the meeting. The communist leader has already committed to complete denuclearization and peace with South Korea during the meeting with South Korean leader Moon Jae-in last month. Asked if the release of the detainees would be his proudest moment, Trump said that complete denuclearization would top his list. The announcement also comes on the heels of Trump’s withdrawal from the Iran nuclear deal. The president has long criticized the arrangement as a failure.